In this piece we tried to look for the true meaning of happiness and the never-ending search for it. Wether or not it actually exists in the real world, and if so, can it be expressed through the body. Falling apart is a sensation that every one felt in his life, the sensation caused from an injury, a trauma or devastating news. Falling apart is when the past is no more and the future is yet unclear. The performers in this piece represent this feeling through physical movement as a result of a vigorous research into the body. 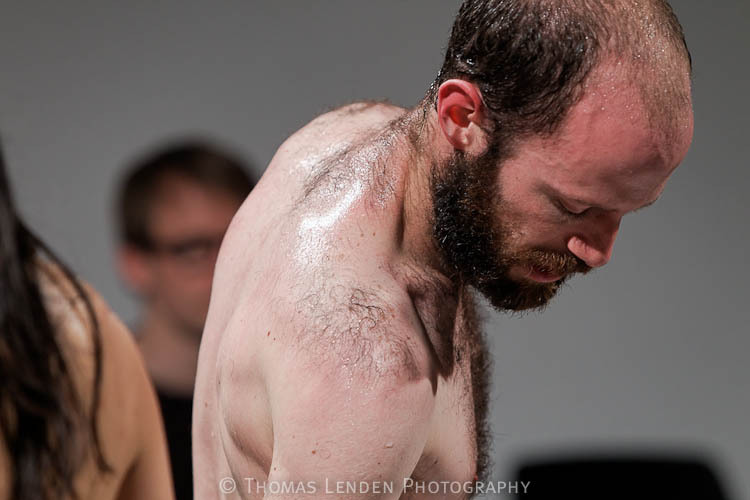 As part of Mono collective, we created this Improvisation performance with a very delicate object – a raw egg. With improvisation you can make magic moments on stage, moments where everything falls into its right place. At other times if you are not aware it all goes crushing into pieces. In this performance, which was held in the old church in Amsterdam, we were making slime like substance and then sending it up to heaven to be wiped clean. In an analog act to our own human life, where no matter what we do, we accumulate “sins” in action and thoughts and then look up to heaven for redemption. (Museum night – Amsterdam). This piece is about the clash between structure and experience. Inspired by the physicality of religious customs, the work is focused on the exhaustion of three characters, a cow, a sheep and an elephant, who attempt to stay tuned through the execution of mutual choreographed movements.